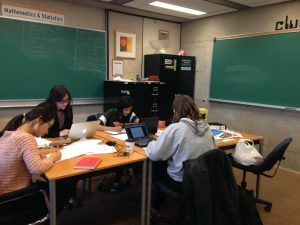 Club Infinity is the undergraduate student club in the Department of Mathematics and Statistics. They organize events for students and act as a liaison between our undergraduates and faculty. Check out their webpage and/or follow them on facebook! Club infinity students hard at work in their club lounge! ASA is the undergraduate student club for our students studying Actuarial Science. They work closely with Club Infinity, but focus on the specific needs of students hoping to become actuaries! Check out their webpage and/or follow them on facebook! There are various ways to get involved, and some include funding! ** Note: individuals that apply for NSERC USRA are automatically considered for the DURA. The William Lowell Putnam Mathematics Competition is a North American mathematical contest for undergraduate students. It is organized by the Mathematical Association of America and is taken by over 4,000 participants at more than 500 colleges and universities. It is considered by many to be the most prestigious university-level mathematics examination in the world! The Mathematical Contest in Modeling is a contest where teams of undergraduates use mathematical modeling to present their solutions to real world problems.